Anyhoo, I have a card on the Scrapbook Adhesives by 3L® blog today, and I’ll share it here too. Go there to see a few close-ups. I used stamps from A Jillian Vance Design – this is not a guest post, but they sent me so many cool stamps to use, I have not had time to get to them all. This card was inspired by the workshop I took over the weekend. I don’t take many classes, but did spend the weekend at Craft Fancy with the super awesome Wendy Vecchi! I had the chance to remember some techniques, and then to update those with new ideas and new products. Wow, so inspiring and fun! So the watercolor paper was inked with Distress Ink and spritzed with water. The swirly tree stamp was heat embossed, and the 3D Foam Star was covered with glitter. I assembled the pieces with 3D Foam Squares. And you know I love photo corners! 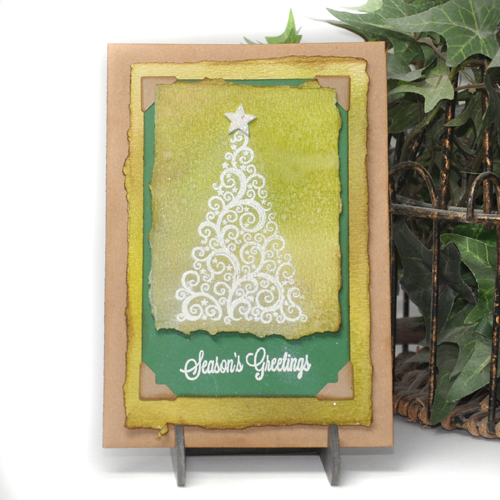 This entry was posted in Card, SCRAPBOOK ADHESIVES BY 3L and tagged a jillian vance design, Christmas, Christmas Tree, Clearsnap, Ranger Ink, SCRAPBOOK ADHESIVES BY 3L. Bookmark the permalink. I love the water color paper and how you etched the rough edges. And, you are right about the photo corners, they add just that little something extra! Visiting via SITS from over at http://www.ritewhileucan.com where I gush over all things stationery and the lost art of letter writing. Ah, so close but yet so far…one of these days I WILL take her class! LOL!! So glad you were able to go and enjoy 🙂 Great card btw!! Wendy Vecchi?? I’m JEALOUS! Beautiful card, Beth! Very pretty!! A darling Christmas tree stamp and love the design of the card.